“Ooh, he’s back,” the barista said from behind the espresso machine. Trimmed in black, with a spoiler that spoke of days at the track, the Vette pulled into the only open parking spot. It happened to be right next to the car I was driving, a silver sedan they never mentioned. But under the hood of my new CTS-V, borrowed from the folks at Cadillac, was the exact same engine as the Corvette, a detail neither of them noted. Nor did they care that it shared the same monster brakes and stellar eight-speed transmission. Or that the spacious, four-door Caddy actually could reach 60 in 3.6 seconds – a full tenth of a second faster than the Vette. But then, maybe that’s the allure of the CTS-V, the American sedan that can offer a stoplight race to anything built in Germany. This is a car with the generally understated style appropriate enough for a lawyer to take a partner to lunch in, yet ready for the drag strip. Maybe right now you’re trying to picture the CTS-V and remembering that first version of this car, the two-door with the big rump. 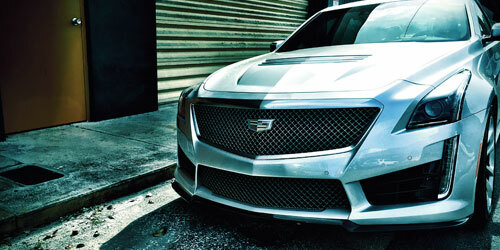 For this year’s model, Cadillac trimmed the back out and produced a car that looks a lot more like the standard CTS. The V version, with a base price of $85,000, has a few distinguishing touches, including shark gill vents that keep the brakes cool and scoops in the hood that look designed by boyhood fantasies. Some might find the trim a bit garish, but they’re eye candy for the executive with a wild side. Inside it looks as well trimmed as anything on the road: leather, suede, wood, all the stuff you’d see in something from Munich. The only interior shortcoming is the performance seats with jutting lumbar and biting side braces that may force you to put a chiropractor on speed dial. Those performance seats come ready to be fitted with track-style belts, and there’s a reason for that. This car has all the performance of a regular to Palm Beach International Raceway, with brake rotors as big as most wheels and handling that keeps this big sedan hugging the turns. It’s so quick, however, it’ll often feel too fast, as I discovered shortly after that trip to Starbucks. Just before we had dinner, I offered to take a couple of friends on a joy ride. They’re both staunch BMW men, with an M3 and M5 between them. That’s direct competition for this Caddy. They praised the interior, complimented the stiff-but-livable ride, and marveled at the explosive pop of the exhaust. Then we took a quick right off Federal, a 90-degree turn followed by a foot to the floor. It sent the back end of the CTS-V nearly sideways, and nearly into a Mustang in the next lane. We were going under 40 – nothing crazy on these local streets – but this Cadillac is always ready to pass on the outside of turn four, always ready to do something surprising. That’s exactly why this car will be purchased. It’s a lot of things – a road trip tourer, a golf-outing stunner, a respectable neighborhood cruiser – and it also happens to have a top speed of 200. So we’ve heard.